Winter doesn’t want to quit! Feeling like spring will never arrive? Let’s fantasize a little. Let’s think about gardens in bloom. And butterflies. We’ll soon be seeing them. Really! 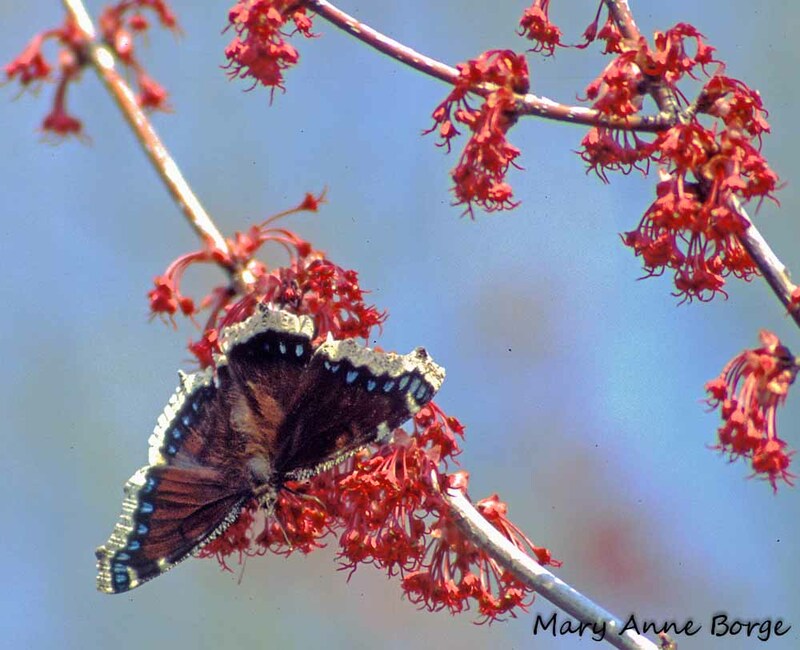 When you think about a butterfly garden, shade may not be the first attribute that comes to mind. But really, maybe it should be. Or at least it should be one of the first. Ok, maybe not shade for shade’s sake, but for the food plants that cast it. When you think about it, many butterflies rely on woody species – trees or shrubs – as food plants for their caterpillars. 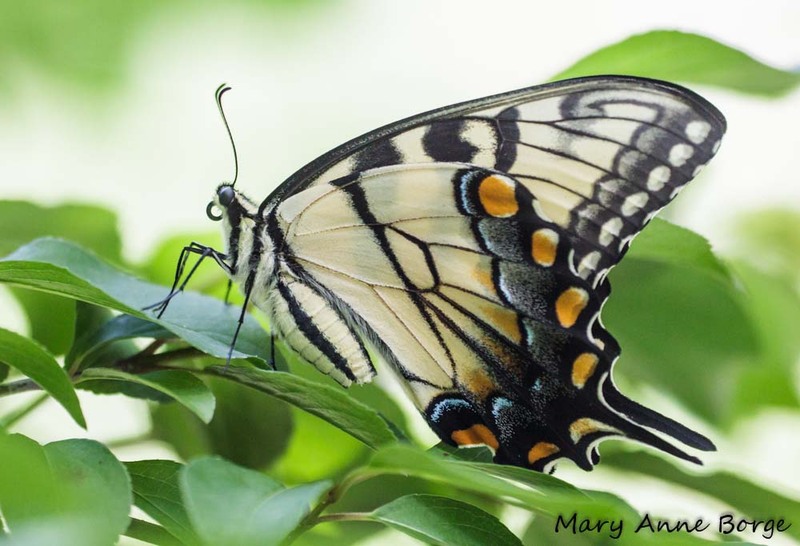 For example, of the six species of swallowtail butterflies that are possible where I live in New Jersey, four require trees or shrubs as food plants, and one uses a shade tolerant vine. Most of the hairstreaks, many of the azure and brushfoot species, and the Hackberry and Tawny Emperor all require trees or shrubs as their caterpillar food plants. Other butterflies have evolved to use shade tolerant herbaceous species like violets, Black Cohosh, and Golden Alexanders as food plants. So a shade garden can be a really valuable asset to the butterflies in the neighborhood. My husband and I chose our house because we like the natural woods that surround us on two sides, preserved 24 years ago by the developer. Even though we live in a townhouse community at the edge of a small town, the woods give us the illusion of living in the country. We love the trees for their own beauty as it evolves through the seasons. 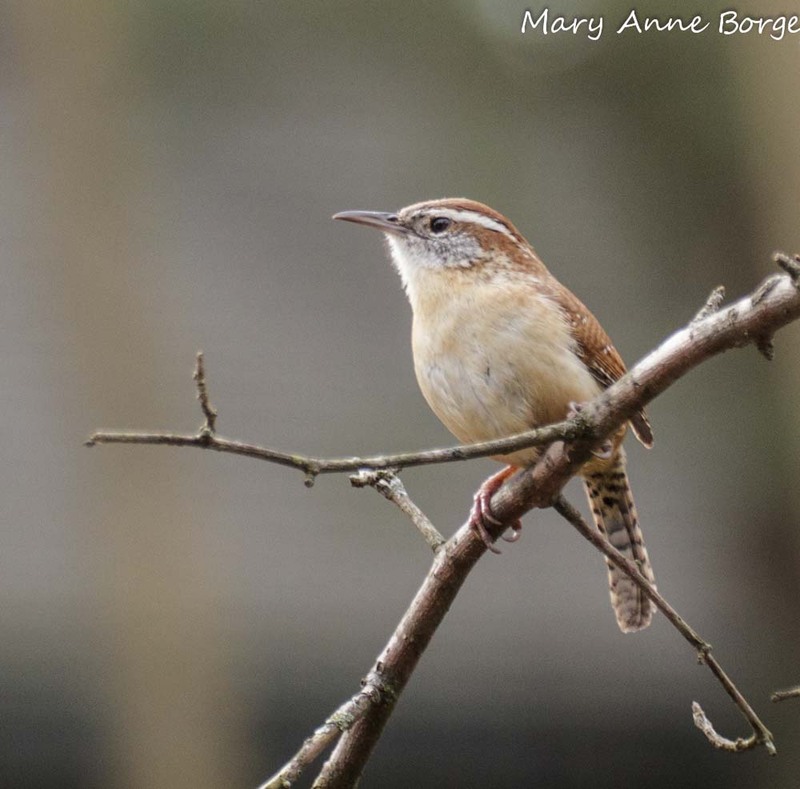 And we love the birds they bring to feast on the fruits and insect protein that are abundant here. Somewhat to our surprise, we found we also had butterflies. As we learned more about them, we realized we had some very desirable territory for butterflies, and other critters, too. Finally, I understood when I saw an Eastern Tiger Swallowtail flitting high up in the White Ash or Tuliptrees, that it was a female laying her eggs on their leaves. The Mourning Cloak may have been drawn here because of the elm trees in the woods behind the house. Why were Spicebush Swallowtails visiting our woodland garden? It’s the food plants, silly; their namesake Spicebush is present here, and so are Sassafras trees, which they are also willing to use. 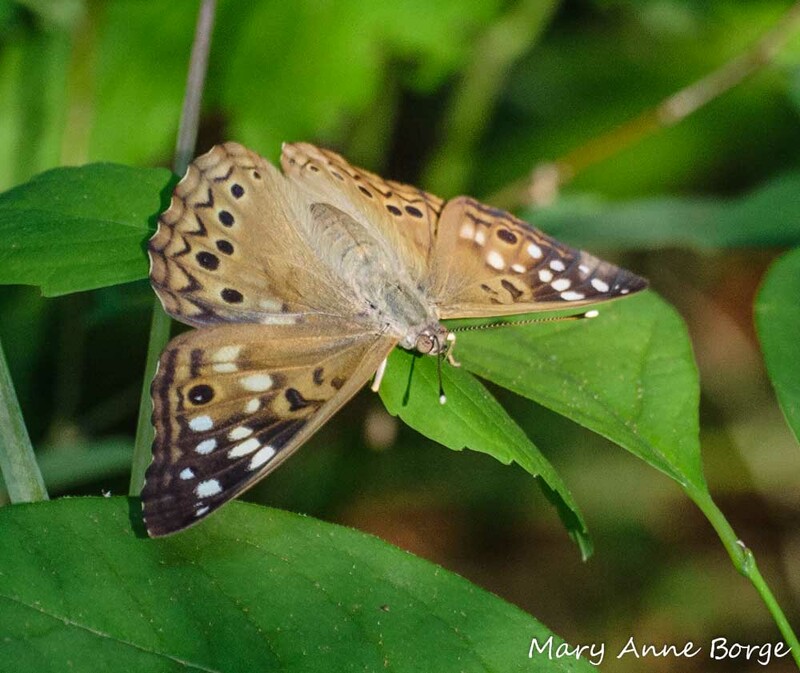 The birds and butterflies have a somewhat mutually beneficial relationship. It’s true that the birds may be interested in eating the butterflies sometime during their lives, but on the plus side, birds keep insect predators of butterflies in check. As a bonus, birds also provide dietary supplements for butterflies that are inclined to dine on mineral sources. 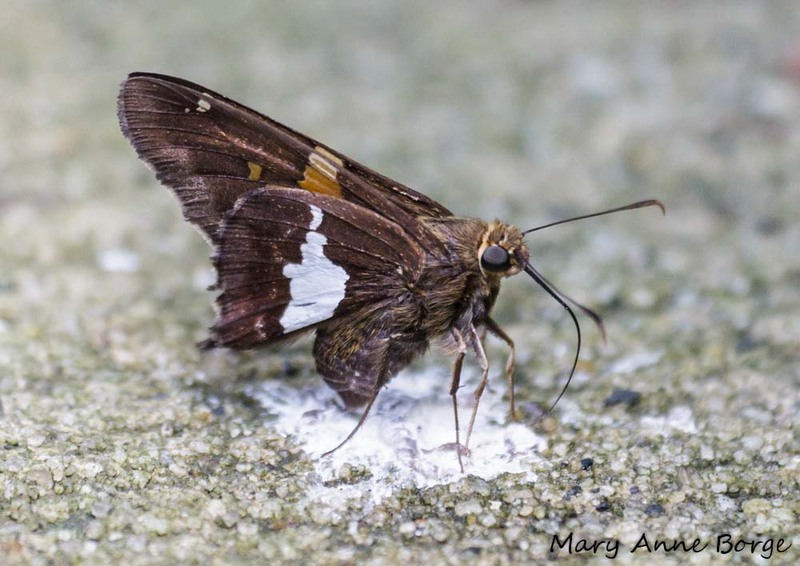 The Silver-spotted Skipper pictured here is sipping the nutritious offerings conveniently left by one of the local birds in the form of its droppings. After stoking up, this little butterfly was off, maybe in search of an appropriate place to lay her eggs, like a near-by Black Locust tree. Red Maple, White Ash, Sassafras, Flowering Dogwood, Blackhaw Viburnum, and a Crab Apple all grow in the common area along side our house. As the trees grew over the years, they shaded out the lawn surrounding them. Moss developed where grass once grew. 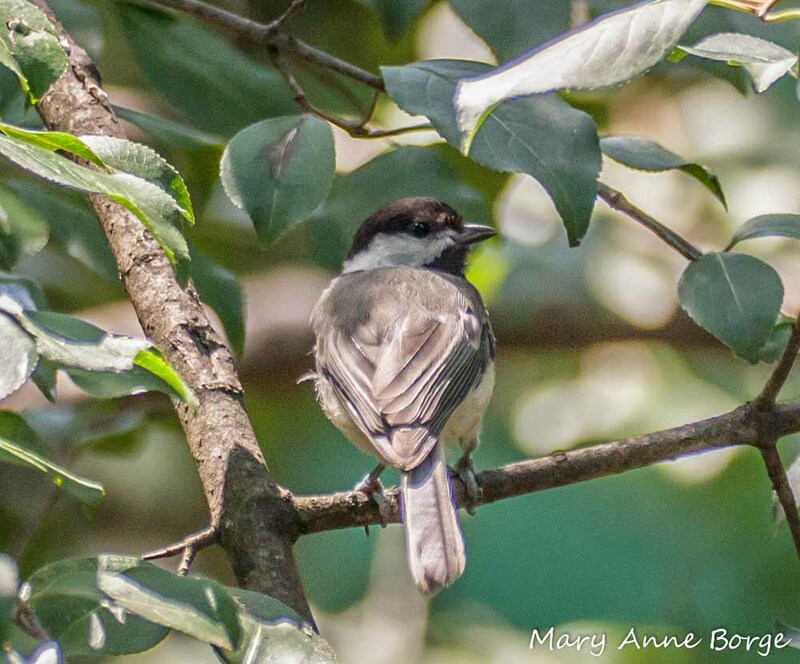 Chickadees plucked the moss until their beaks were full, gathering the soft lush material to line their nests. This was great! So we decided to embrace the shade. It was futile trying to maintain a lawn that disappeared by July every year. 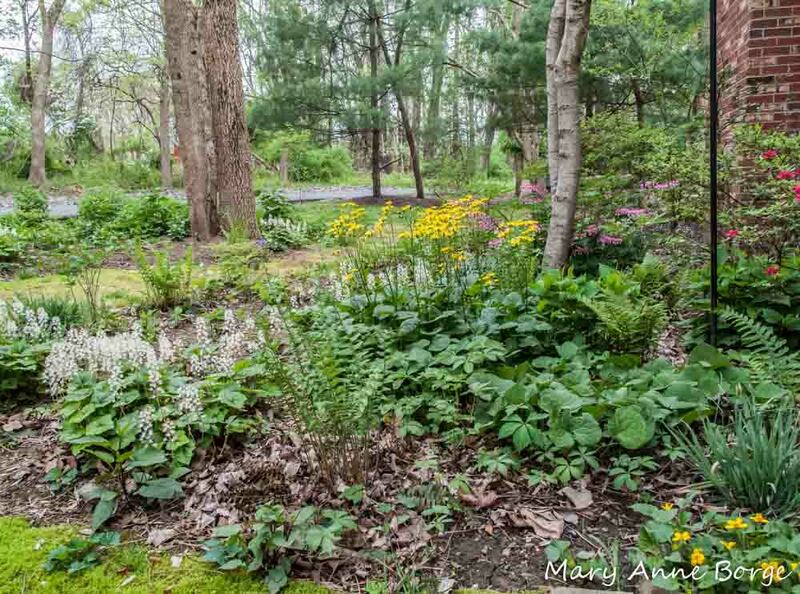 We got permission from our homeowners’ association to plant a shade garden under the trees and in place of the lawn that once grew next to them. This was a win for our association, since money would no longer have to be spent fruitlessly reseeding, fertilizing and mowing the lawn, or more accurately, the mud. 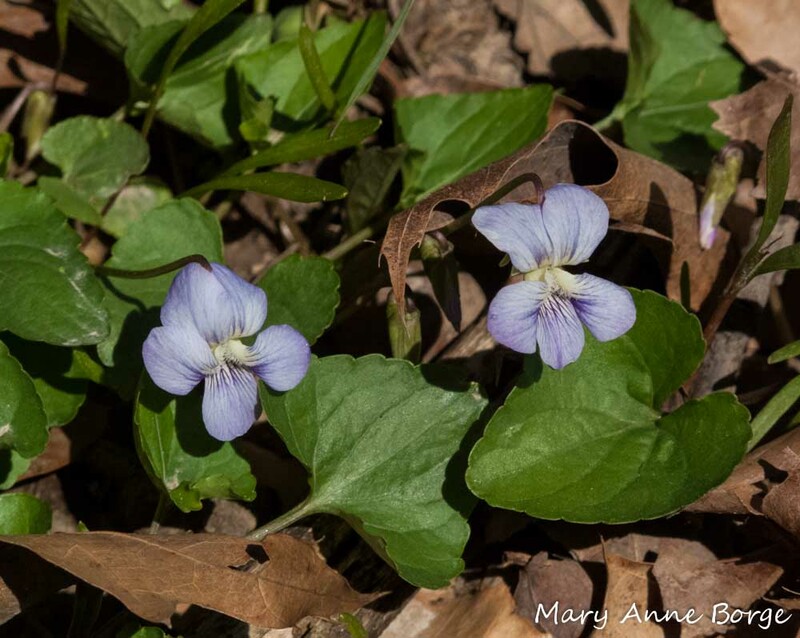 Now we have a constantly changing display of blossoms, ferns, sedges, foliage, and fruits. 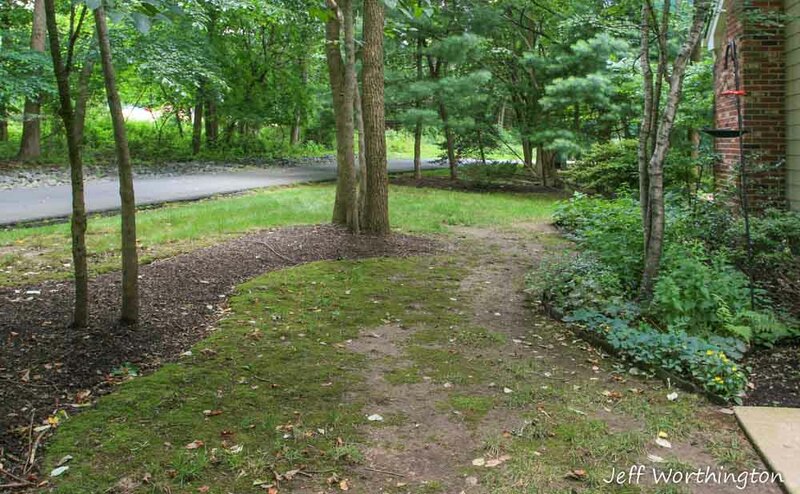 We took advantage of the moss, encouraging it to cover a winding path through the garden. There is always something blooming from about mid-April to the end of November; sometimes longer if the Witch-hazel is especially happy. After that, the fruits offer visual appeal for us, and food for our local residents. 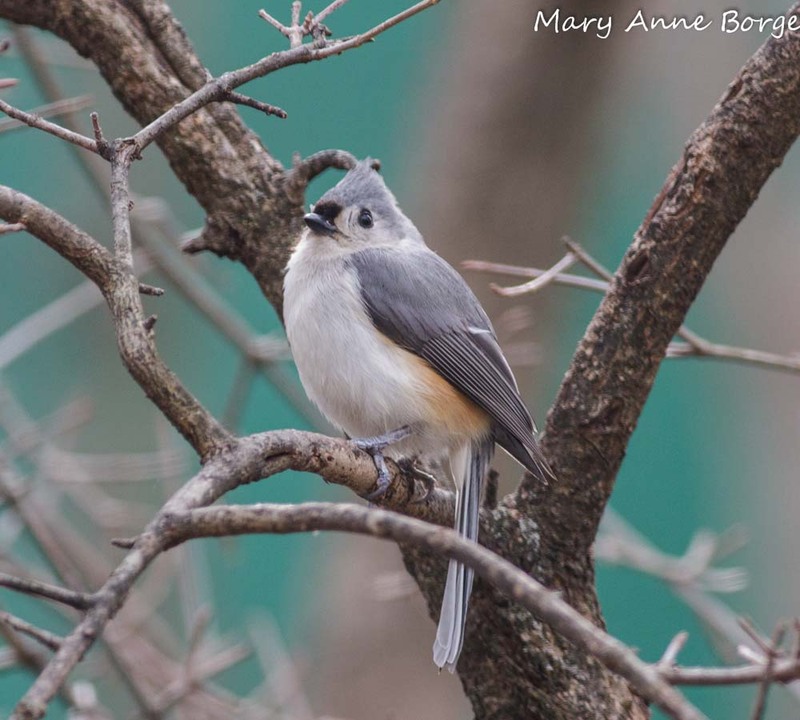 The birds love the new habitat, and we have more butterflies than ever, enjoying nectar and other food sources, and looking for a place to start the next generation. I have my desk facing a second floor window so I can be easily distracted by birds, or watch a female Spicebush Swallowtail pause on a Sassafras leaf to lay an egg, then float down to lay another on the Spicebush that entices her below. In future episodes, I’ll tell you more about the plants here and the critters we see enjoying them. 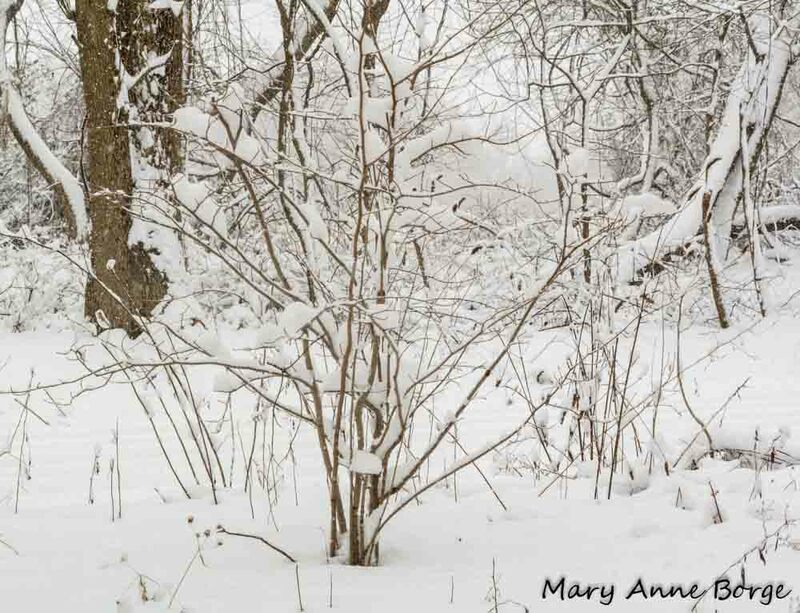 This article was adapted from one that was published in the Winter 2012 issue of Butterfly Gardener, a publication of the North American Butterfly Association. 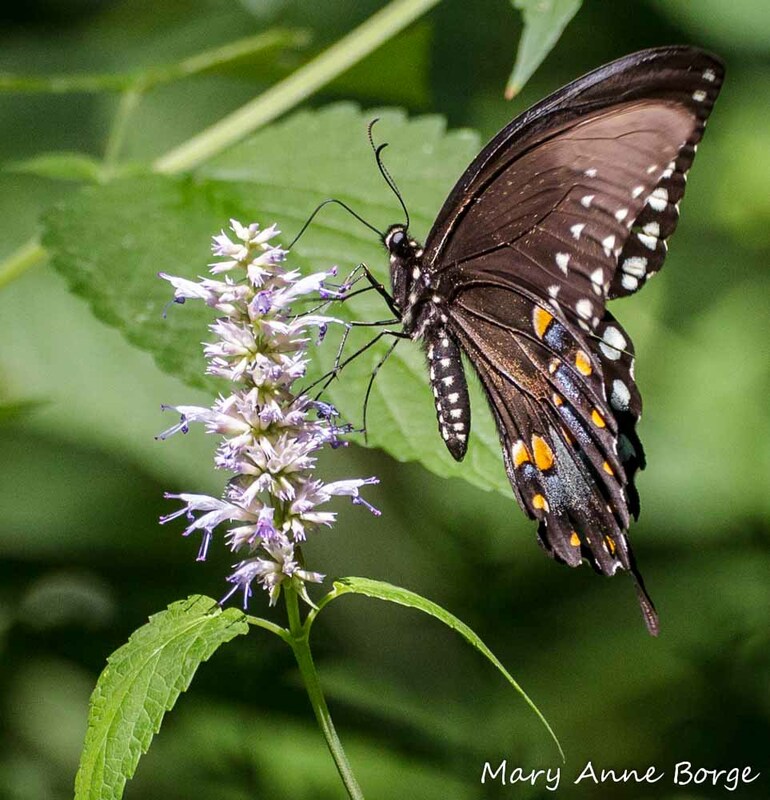 This entry was posted in Birds, Butterflies, Gardening for Wildlife, Native Plants and tagged Butterfly garden, Mourning Cloak, nature, Shade Garden, Spicebush Swallowtail, Wildlife Garden by Mary Anne Borge. Bookmark the permalink. 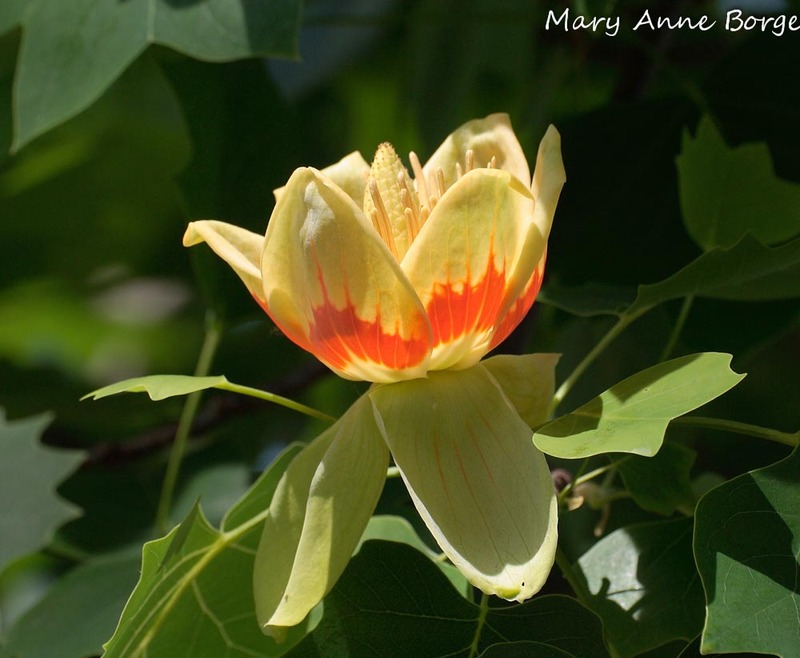 Thank you for welcoming your readers into your very own garden: it’s quite wonderful! I’m glad you enjoyed your virtual visit! Field trip??? Your article makes me want to visit! Wow, what a gorgeous shade garden!! Just love your posts.